It’s odd for me to get surprised by an old comic book. I tend to remember what comics were good, especially when it comes to legendary artists. I had completely forgotten that World of Krypton was drawn by Mike Mignola. Of course, this was a period in my life when I wasn’t buying comics regularly. The books I had been buying before, like John Byrne’s Superman were also not the ones that I ended up buying when I started up again. I recall reading Superman #18, where he returns to Krypton and has a vision of a world where all of Krypton evacuated to Earth. However, that was half a year later. 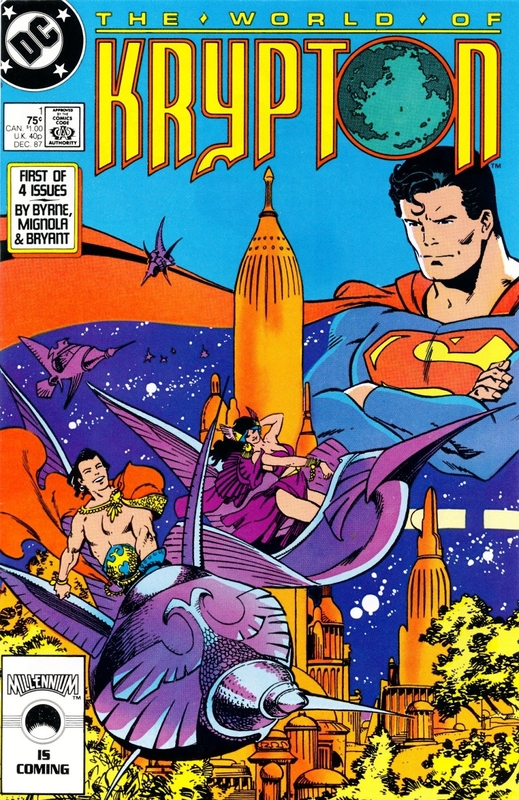 Cue to one sleepless night when I was browsing DC Universe and came across World of Krypton, the 1987 mini-series that fleshed out the view of Post-Crisis Krypton we had seen in Man of Steel #1. I read the whole series in one night and to be honest, I enjoyed the first issue much more than the others, especially the last issue. The last issue actually did a lot of retelling from aforementioned Man of Steel #1. The first issue impressed me enough that I felt like I needed to review it. On ancient Krypton, Van-L enjoys a joyride in a personal flier on a beautiful day. It’s his day of passage, when he will become an adult under Krypton’s laws. He’s joined by a girlfriend, Vara. He invites her to share a meal on Kantor Mountain. She is reckless racing him to the mountain, and crashes her flier. Van-L takes her to the hospital. At the hospital, he has to go through protesters, chanting slogans of rights for clones. The doctor takes Vara and asks Van-L to wait. In the guest facilities, he encounters Kan-Z, who is visibly agitated and belligerent. A doctor arrives and confirms something for Kan-Z. This upsets him greatly. Van-L is then let in to see the recovering Vara, who is expected to make a full recovery, due to Van-L getting her to the doctors as soon as possible. Vara required more reconstruction than any person the doctor had worked on in a thousand years. Vara’s father enters, thanking Van-L and wishing him well for his passage. Van-L returns home for his passage, and his father hasn’t returned from Kandor. His mother is upset and shows him the news from Kandor. It shows widespread rioting with anti-cloning zealots destroying doctors. Van-L’s father arrives and Van-L is reassured that everything will go forward with his passage. As Van-L and Vara celebrate at the passage, his father debates with others the question of granting rights to the clones. He cautions that doing so will mean that Kryptonians will need to accept inevitable aging and death. The debate is interrupted abruptly by Kan-Z’s mother Nyra. She is announcing that her son is to be married. Van-L is concerned, given Kan-Z’s behavior earlier. Before he can fully voice his concerns, Kan-Z drunkenly barges into the celebration, visible in a drunken rage. Kan-Z calls his mother a witch, assaulting her. Van-L tries to stop him, but Kan-Z draws a gun and kills his mother. Before he can kill himself, he’s grabbed by Van-L and others. The story is very engrossing. It’s very fitting for the story to revolve around Van-L’s day of passage into adulthood. This story essentially begins with a young man with no responsibility and by the end he finds himself catapulted into being personally responsible for a new and much more dangerous world. It appears on the surface to be the start of a classic Hero’s Journey. Van-L gets a call to adventure when he witnesses Kan-Z receiving bad news, but refuses the call in order to continue his normal, privileged and hedonistic life. He meets the mentor in his father, who is dealing directly with the building revolt of the anti-cloners. Finally the threshold is crossed when Kan-Z’s murderous intrusion on his party. Literally, the adventure is intruding upon his old life. The artwork by Mignola shows signs of the style he would become famous for. There are the large swaths of black that define mood, but the real treat in early Mignola is where he flexes his creative muscles. The stylized ships of Krypton are just gorgeous and give the sense of a decadent culture at its peak. The clothing styles are extravagant and just enough unlike anything in human history to appear obviously from another world. It’s early Mignola, but in a lot of ways, I prefer it to his later work, especially on Hellboy. I have a real problem with the colors, for while they’re adequate in accenting the artwork and don’t get in the way, they don’t really assist the story. This was still the pre-digital days of comic book coloring. If you’re looking for the issue itself, then you should be able to find it with a little searching. Don’t pay more than a few dollars for it, as you can probably find a copy in bargain boxes. If you want to read it digitally, then you can find it on Comixology. This issue has been collected in Superman: The World of Krypton (ISBN: 1401217958) and more recently, Superman: The Many Worlds of Krypton (ISBN: 1401278892). It’s also available on DC Universe.